Package Includes : 1 x Chauvet SM-250 4 x Gallon of Snow Fluid : Chauvet SM-250 : Snow Machine is a high output snow machine with user-friendly volume adjustment included via the included wired timer remote, built-in DMX and digital display. Snow Machine also features a convenient Hi/Low blower switch for coverage of near and far distances and its non-toxic water based snow fluid (sold separately) is safe for all environments. 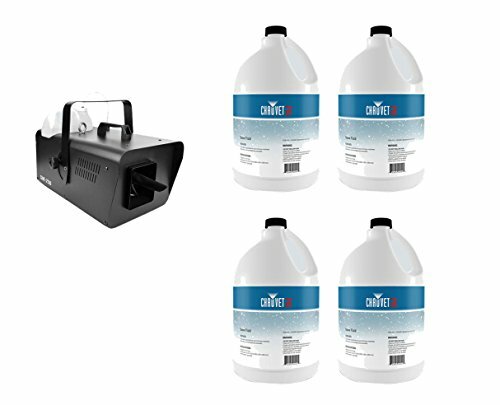 Gallon of Snow Fluid : CHAUVET fluids are designed and tested to provide exceptional output from CHAUVET fog, snow, and bubble machines. The use of other, inferior products can cause irreparable damage to your machine. Play it safe and get maximum output by trusting CHAUVET fluids.